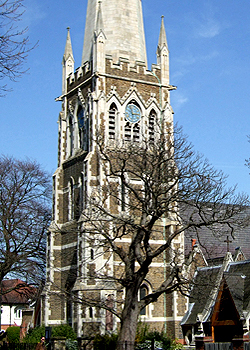 The most striking and characteristic external features of the church are its tower and spire at the west end of the church. The church tower is well-proportioned, with three stages, a battlemented parapet, pinnacles (shown right) and corner buttresses. It was made of mellow London stock bricks with stone dressings in 1887. The main walls of St James's tower are over three feet thick at the base, reducing to just under two feet thick at the upper belfry level. It is 64 ft high to the top of the battlements. The baptistry is housed in the lowest part of the tower. A stone spiral staircase of thirty one steps leads from the baptistry up to the lower section of the belfry (bell tower) where the bell ropes and the clock mechanism are housed. From here there is a wooden ladder leading to the clock chamber in the upper part of the belfry. 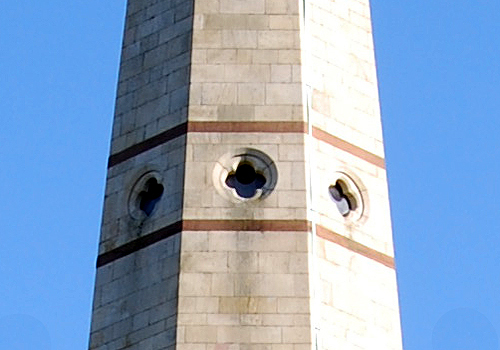 The clock and bells are housed in the clock chamber and the four clock faces show on the outside of the tower, one on each side. 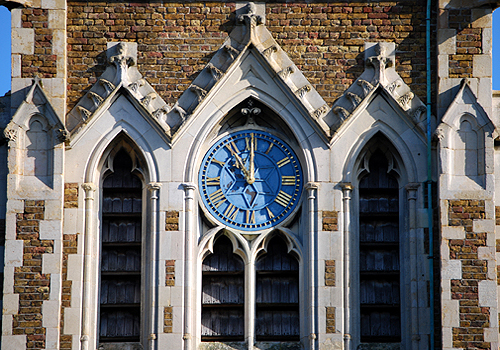 The windows in the tower do not have glass, but openings or louvres in the stonework so that the sound of the bells can travel. From the clock chamber further wooden ladders lead to a wooden landing or viewing platform from which it is possible look out of window openings in all six faces of the spire. 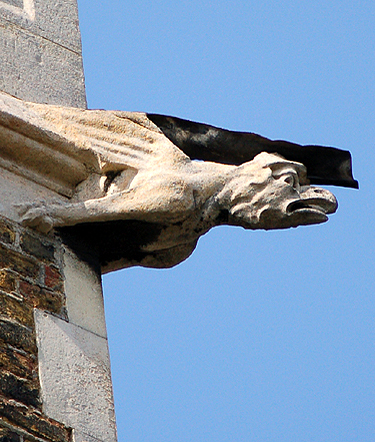 A gargoyle is the carved stone waterspout rather like an ugly-looking head. 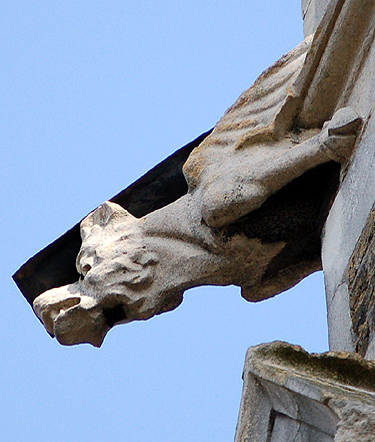 There is a different gargoyle on each of the four corners of the top of the tower, see below. The spire, with a cross at the top, is a gracefully tapering structure which rises above the tower in the form of a tall cone or pyramid. It was made entirely of Portland stone, pierced with brick banding and rises to 157 feet (approx. 48m). It is hexagonal (six sided) with three sets of bands each enclosing six windows. The height of the spire above the tower is eighty two feet, and on top is the cross, making a total height above ground of about 152 feet. The spire is a familiar and prominent local landmark. Many people think it looks like a finger pointing upwards to heaven, reflecting the mystery and wonder of God. 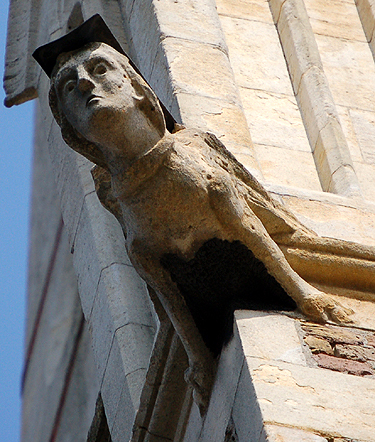 The celestial and hopeful gesture of the spire is one reason for its association with religious buildings. 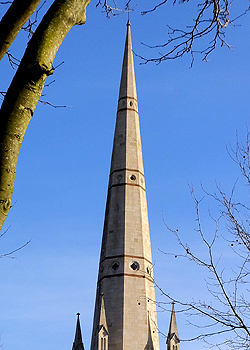 Built to coincide with Queen Victoria's golden jubilee, the spire was the last of several enlargements and additions to the originally rather modest church of St James, built in 1863 by its first vicar, thus marking the beginnings of Hampton Hill as we know it.